The Beaverton Community Band and the Rex Putnam High School Band are partnering to bring seven Portland-area community bands together for the Adult Band Festival on Saturday, March 9, 2019. Doors open at 9:00 A.M., with the first performance beginning at 10:00 A.M. The festival celebrates American band music in its purest form – live, local, and authentic. The participating bands are ambassadors who keep band music alive, inspire others, and introduce young musicians to this tradition. Beacock’s Band, Cory Pederson, Director, 10:00 A.M.
*Beaverton Community Band, Martin Sobelman, Conductor, 10:45 A.M.
Southwest Portland Concert Band, Nick Caldwell, Director, 11:30 A.M.
Rose City Gay Symphonic Band, Joseph Accuardi-Gilliam, Conductor, 1:15 P.M.
*Al Kader Shrine Concert Band, Jeff Hornick, Director, 2:00 P.M.
*Vancouver Community Concert Band, Erin Hanson, Director, 2:45 P.M.
Local music vendors, who have donated items for a raffle, will be on site to demonstrate their products and perform any necessary emergency repairs. All raffle proceeds, as well as – more – donations and proceeds from refreshment sales, will benefit the Rex Putnam High School band program. Saturday, March 9, 9:00 A.M. to 4:00 P.M.
Donation: Adults $5. Students K-12 free. The Beaverton Community Band has performed for the Beaverton community for over 30 years. Winter Concert, Bethel Congregational United Church of Christ, March 24, 2019, 3:00 P.M.
Spring Concert, Bethel Congregational United Church of Christ, June 2, 2019, 3:00 P.M. The Beaverton Community Band’s mission is to engage audiences with diverse artistic performances, enlighten the community through music education, and enrich the lives of its members. The band’s members volunteer their time to support music educators throughout the Beaverton School District, to encourage beginning musicians and build a vibrant arts community. As a volunteer you will be able to see this great concert for free. Join us as the Beaverton Community Band presents its Fall Concert on November 11th. The concert, featuring the Bethel UCC Chancel Choir, honors our nation’s veterans, including a veteran who was also a former President of the United States, John F. Kennedy, and gives thanks for all that we have. Volunteers are needed to Setup, Welcome, Usher, Directing traffic and Hospitality. Please dress to be presentable. you must be 15 yrs or older. 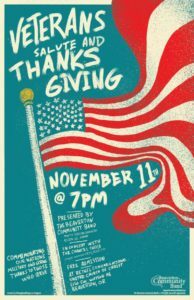 The Beaverton Community Band opens its 2018-19 season with a Fall Concert, “In Celebration of Veterans and Thanksgiving,” at 7:00 P.M. on Sunday, November 11, 2018 at Bethel Congregational United Church of Christ, 5150 SW Watson Avenue, Beaverton, OR. 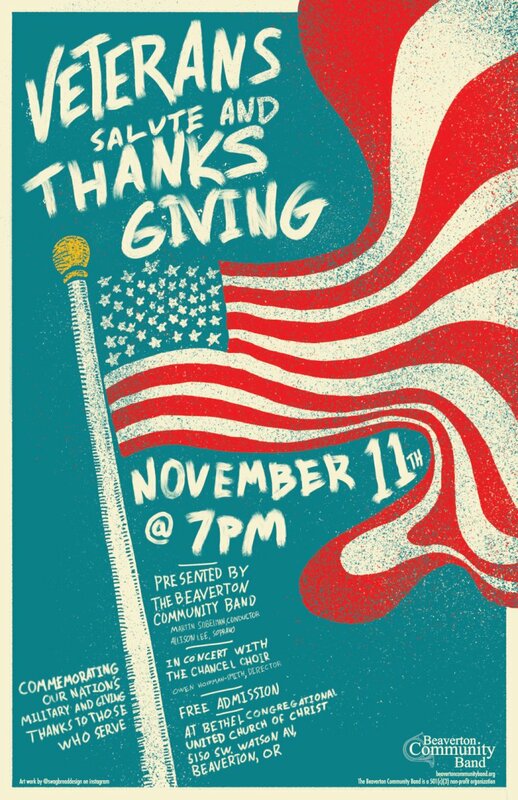 The Beaverton Community Band presents its Fall Concert on November 11th. The concert, featuring the Bethel UCC Chancel Choir, honors our nation’s veterans, including a veteran who was also a former President of the United States, John F. Kennedy, and gives thanks for all that we have. The program explores the music of the years surrounding the Civil War, World War I, and World War II. The audience will recognize many of the tunes and titles, from variations on “When Johnny Comes Marching Home” to a John Philip Sousa work composed around the famous poem “In Flanders Fields” and featuring Allison Lee, Soprano. 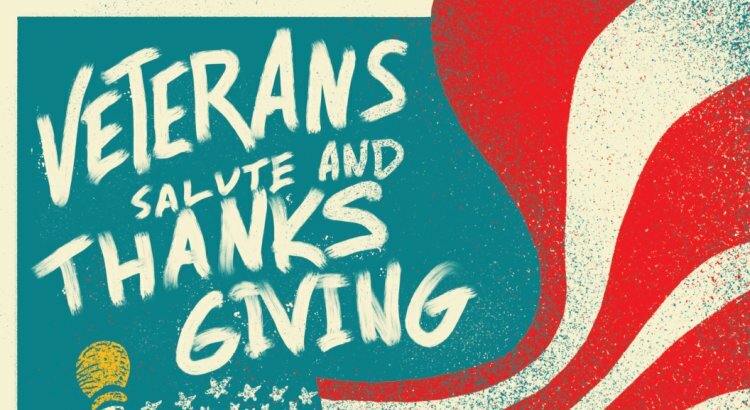 These pieces are just some of the music that helped to weave the fabric of our country, and are especially appropriate for the Veterans’ Day concert date. In addition to honoring our veterans and their sacrifices, the program celebrates all that we have. From the deeply emotional and human “Dum Spiro Spero,” to the “Gaelic Blessing” that expresses hope, a desire for a better future, and a wish for solidarity with family, friends, and neighbors, the music invites the audience to reflect on what they are thankful for at the start of this season of thanksgiving. The Beaverton Community Band has performed for the Beaverton community for over 30 years. The Fall Concert is the first of the band’s season.